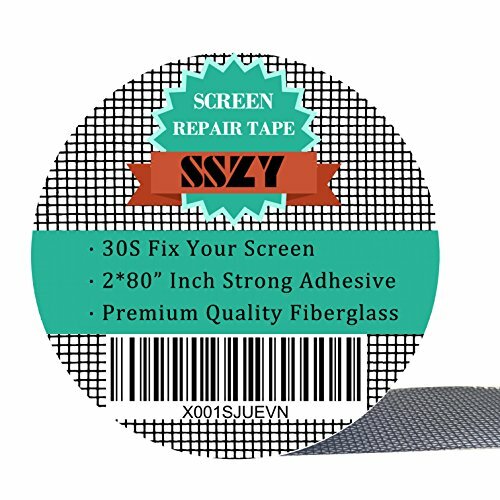 ★Strong Self-adhesive★--Three layers, Transparent self-adhesive have been stick to one side of Fiberglass Mesh. ★30 Seconds Fix★--①Clean the window screen, dust will reduce stickiness. ②Cut the size you need. ③Tear out the white cover, stick the broken screen. ★Premium Quality Fiberglass★--Made of premium durable fiberglass. Keep mosquito, insect, pest away from your home and family. ★100% Satisfied!★--Worry-free 12 month 100% refund and friendly customer service. If there are any problems or recommendation, please contact us, we are waiting for your sounds and will reply to you as soon as possible. no screen repair Sundays here!